Thought you might enjoy the baked guisquil I prepared this morning. I found this squash hanging from a vine in the garden and asked the gardener, who was here today, what it was. He explained that it’s often used in soups. oven for about 1/2 hour. We’ll eat it for lunch with rice. 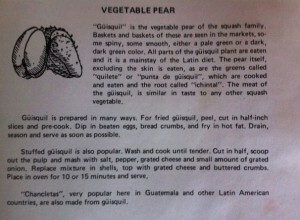 I’ve been wondering how to conjure up a version of Liana’s exotic Guatemalan squash since July. With an abundance of shiny zucchini in the fridge this week it finally dawned on me to use the local vegetable—just as she did in Antigua. Thanks my friend, for the inspiration. My version, pictured at the top of the page, includes bell pepper and tomatoes from our garden. Feel free to experiment as well. Cut stems off the squash and halve the squash lengthwise. With a teaspoon carefully scoop the flesh out, keeping the skins in one piece. Chop flesh into small pieces. Heat 1 tablespoon oil in a large skillet over medium heat. Add onion, bell pepper and garlic and cook until onion is soft. 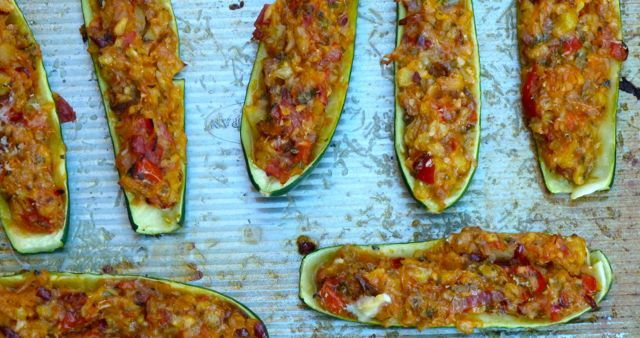 Add chopped zucchini, oregano and tomato and cook for 3 to 4 minutes until the mixture is tender. Cool slightly. Stir in basil and 1/4 cup Parmesan, then season the mixture lightly with salt to taste. 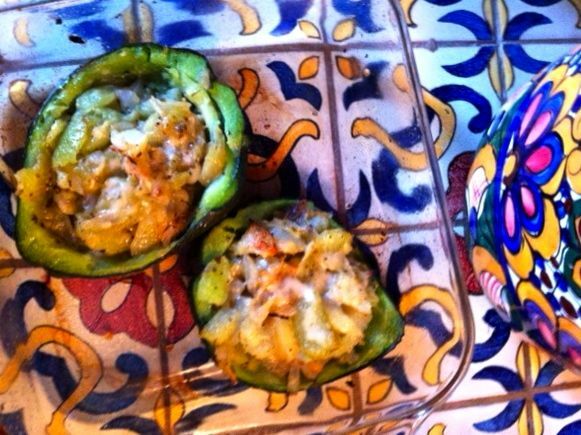 Place zucchini skins on a rimmed baking sheet, lightly coated with oil. Using a tablespoon, fill the skins with the stuffing mixture, distributing the mixture evenly. 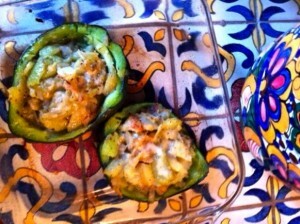 Loosely cover the stuffed squash with foil and place into the oven for 15-20 minutes. Then uncover and cook for an additional 15-20 minutes until squash is tender. Serve warm or at room temperature. Sauté tomato cubes lightly with chopped garlic until barely soft. Toss with a bit of chopped mint, cooked pasta (beans or whole grains like farro would be nice as well), fresh ricotta and a drizzle of olive oil. Use fresh ricotta if you can find it (makes all the difference). Add mint to a mixture of half iced tea and half lemonade (or simply an iced glass of water with a slice of lemon). For a refreshing digestive-aiding, after-dinner beverage, steep mint springs and leaves in boiling water for 2 to 3 minutes. Strain and serve with honey or plain. Sauté chopped kale with garlic and cubed tomatoes. Or add carrots instead. Roast zucchini and carrot rounds in a bit of olive oil. Toss with chopped mint before serving. Fall apples inevitably lead to apple crisp in our household. Another option is to toss the diced fruit with roughly chopped kale and a light vinaigrette. Add a few chopped, toasted walnuts as well (toast nuts in a dry skillet over medium-low heat until they are fragrant and begin to brown). If you find raw kale difficult to chew try massaging it with a bit of salt or lemon juice until you feel it soften in your hands. Then toss your salad as usual. This entry was posted in Journal, Recipes and tagged basil, bell pepper, gluten-free, summer squash, tomato, zucchini by Four Cooking Together. Bookmark the permalink. 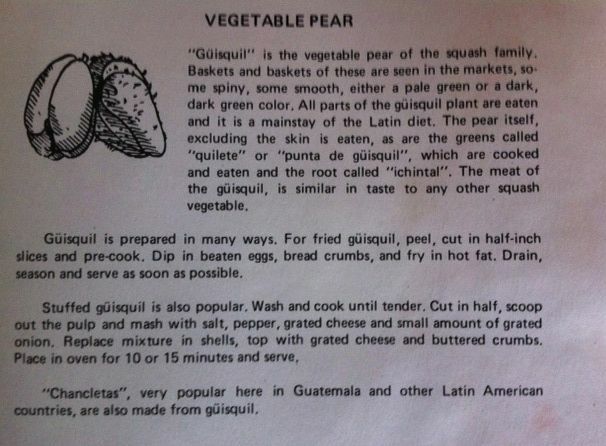 I’m inspired…our version of Almost-Guatemalan Squash will be featured on our dinner menu this week – thanks Ann!